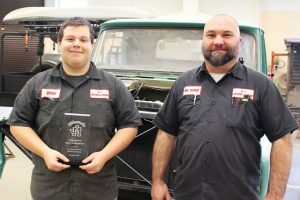 Brian Dabrawsky and William Holmes Jr. have been selected as John Marshall High School’s December Career & Technical Education Students of the Month. 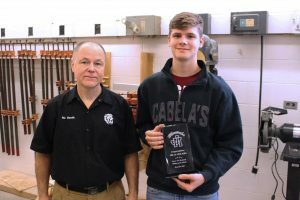 From left: Brian Dabrawsky is presented his plaque by Collision Repair teacher Joe Wendt for being named CTE Student of the Month. Dabrawsky, a senior in the Collision Repair program, will take the skills he has learned in the classroom and use them when he becomes a Diesel Engineer. “I have learned from Mr. Wendt that it’s important to get my projects done and do them right the first time.” His parents are Brian and Lisa Dabrawsky. Millwork teacher Eric Booth congratulates William Holmes Jr. for earning the CTE Student of the Month award. Holmes is a junior in the Millwork class. He is currently employed by McCann Distributing Inc. in Wheeling where he operates a forklift and does construction jobs. Holmes plans to attend a technical school after graduating from JM. He is the son of William and Laura Holmes.